BATON ROUGE, La.–At its April meeting, the Louisiana Wildlife and Fisheries Commission undesignated a portion of the Public Oyster Seed Grounds east of the Mississippi River. This action will not occur until the first lottery phase of the oyster moratorium lifting process commences. The Louisiana Wildlife and Fisheries Commission will continue considering the oyster moratorium lifting process in the coming months. Lifting the long-standing oyster lease moratorium and turning some public oyster grounds into leasable areas is part of an ongoing effort by the state to assist the oyster industry in adapting to changing coastal conditions. 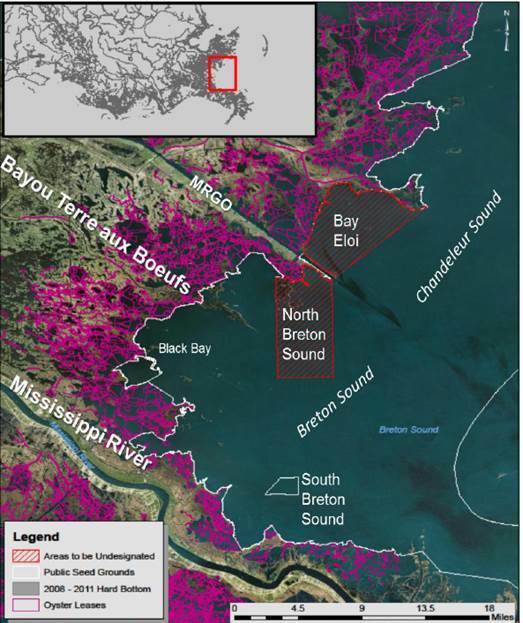 Approximately 40,248 acres of the seed grounds in Bay Eloi and northern Breton Sound will no longer be designated as a seed ground upon commencement of the first lottery phase of the oyster moratorium lifting process (also described as Phase Four of Section 2 of Act 595 of the 2016 Regular Session of the Legislature). This acreage only consists of 4 percent of the Public Oyster Seed Ground area east of the Mississippi River. The below described areas will no longer be designated as a seed ground and will be available for oyster leasing upon commencement of the first lottery phase of the oyster moratorium lifting process. v. following the current public oyster seed ground boundary line and shorelines back to point of beginning. iii. following the current public oyster seed ground boundary line and shorelines back to point of beginning. See above for a map depicting these areas. The Louisiana Department of Wildlife and Fisheries is charged with managing and protecting Louisiana’s abundant natural resources. For more information, visit us at www.wlf.la.gov. To receive email alerts, signup athttp://www.wlf.la.gov/signup.